I was born and spent the early years of my life in Peterhead, a fishing town on Scotland's north east coast. 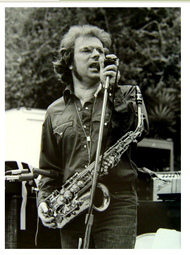 My father was a musician and ran a dance band called The Melody Makers. My earliest musical memories are of my dad's pals coming to the house to listen to new records on our radiogram, mostly swing stuff or jazz from guys like Benny Goodman, Teddy Wilson and Gene Krupa. Krupa started my toes tapping when I was about three years old and they've been tapping ever since. Stephan Grappeli was dad's hero and I loved it when he played along with his Hot Club records. Allez Django! Allez Dad! I thought everybody's dad played music and listened to imported jazz records. It came as quite a surprise when I found out that that wasn't always the case. My grandmother was from a tiny village on the Banffshire coast. That side of my family were deeply religious, hard working, God fearing men and women whose livlihood depended on the sea. A visit to my folk in Gamrie never passed by without a sing-song around the harmonium and a hymn or two from Auntie Maggie. She played the auto-harp while Uncle Jimmy (everyone called him "Baker") scraped a tune out of his old fiddle. There was music everywhere. Everywhere! The family moved down to the Midlands of England in the mid 1950s, a totally unnerving culture shock for a five year old kid who spoke a heavy North East Scot's dialect. A lot of people were on the move at that time, jobs were hard to come by in the post war years and folk did what ever they could to earn a crust. It took some time but I did eventually settle into the new way of life. One of my school pals had an older brother who had a little record player and a bunch of records by people I'd never heard of. 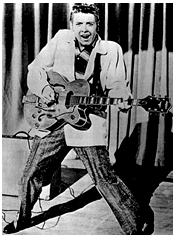 I remember hearing Eddie Cochran's "Somethin' Else" on Stan's Dansette Junior. That really struck home! Wow, what's this all about?! He also introduced me to The Shadows. We would sit by the little record player for hours on end listening to Hank and the boys. Magic! Never thought I'd see the day when I'd be shoulder to shoulder with Bruce behind a massive Abbey Road mixing desk. But it happened. I've had the privilege of working with some truly great people. Some of the greats weren't too famous. Some of the famous weren't too great. That's the way it goes. Once upon a time everybody had their own job in the bizz. Cole, Hoagie and their lot wrote the songs and Bing, Frank and their lot sang them. Then came the dawn of the singer songwriter, guys who wanted to shake the whole world up, guys with something real to say. Rock 'n' Rollers like Little Richard, Jerry Lee and Chuck Berry! Wow, I can't believe I actually lived through all that. It's Only Rock n' Roll - But I Like It! Nobody wanted to be a train driver or a test pilot anymore. Everybody I knew wanted to be a rock n' roll star. I got a little spanish guitar for my tenth birthday and with it came a copy of Bert Weedon's Play In A Day. I later found that a lot of guitarists on this side of the pond started their journey with "Bert's Bible." I remember playing Bobby Shaftoe's Gone to Sea over and over till I could change from a C chord to a G and back, almost seamlessly. I played every day till my fingers bled. At the same time I was working on a seriously dodgy rendition of the Shads' FBI. Meantime, way out west, Dr. Heinz De Koster (Ph.D. of physics) was working on a way for kids in the UK to listen to rock'n'roll late at night, without disturbing their parents. His work led to the introduction of the transistor radio, an ingenious device which revolutionised access to new music. I clearly remember lying under my bed covers with my trannie ear piece firmly in place on Sunday nights listening to "The Hit Parade" on Radio Luxemburg, "Fabulous 208." The signal came and went as the whole thing whistled, crackled and screached, sometimes interrupted by the distant sound of a foreign voice reading the news or something, but that didn't matter. This was just about as good as life could get. A million miles away from school dogma and that psychopathic headmaster screaming at me about the evils of tight trousers, pointed shoes, talking to girls and, worst of all, chewing "American spearmint gum". Maybe he was right? No, there can be no doubt about it. The guy was nuts! So, where was I? Oh yeah, Radio Luxemburg. It was during one of those late-night, under-cover music sessions, back in the autumn of 1962, that I first heard a rough harmonica lick followed by a couple of guys singing in harmony over a head-nodding, toe-tapping beat. I didn't realize it then, but my life was about to change for ever. The DJ announced at the end of the record that it was the latest single from a new group from Liverpool. The song was called "Love Me Do" and the new group was called "The Beatles". Through the years that followed I listened intently to the Fab Four's music and every word they had to say about the music they were listening to. That's how I found Dylan, the jingle jangle sound that Roger and Dave called The Byrds and, a wee bit later, the home grown groove we call The Band. The Dylan trail led me to the radical, humanitarian genius of Woody Guthrie and the hard time, bad luck blues of Huddie "Lead Belly" Ledbetter. That's how it works. One thing leads to another. It's a massive family tree, and we're all one big happy family! Then came all those great singers, the ones who could break your heart with the sound they made. Smoky, Dusty, Levi, Big Joe, Aretha, Frankie Miller, Paul Rogers, The Rod. And what about all those soul-men? Jackie Wilson, Wilson Picket, James Brown, Sam Cooke. Can't sing like that? C' est la vie, just go with what you got. One of my first records was an EP by an Anglo - Australian bloke called Frank Ifield. 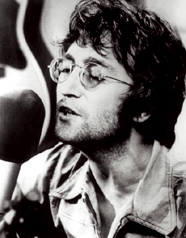 He was the first singer to sell a million records in the UK. One of the tracks was a song called Lovesick Blues. 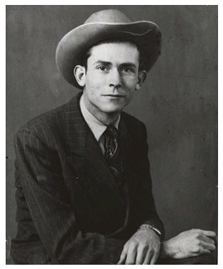 That led me to Hiram 'Hank' Williams, 'The Hillbilly Shakespeare', country swing virtuoso and master of the three chord trick. Then came the governors of pop'n'roll, yeah, yeah, yeah, John and Paul took the bull by the horns and turned popular music into a way of life. Mick and Keith were right on their heels with their very own brand of rhythm and blues. 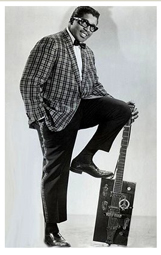 Their early material was straight ahead blues and R and B, stuff they'd gleaned from records imported from the States. Guys like John Mayall and Alexis Corner had led the way on that front. That's how it all happened. Following the Stones' trail took me back through Buddy Holly's Not Fade Away to the undisputed groove champion of the world, the one and only, late and totally great, Bo Diddley. Like the man said, "If it don't swing it don't mean a thing!" Or was it the other way round? Not too sure but who cares? Truer words were never spoken. No band stands a chance without a hot drummer. That's where the drive comes from. The engine room. I love bashing the old tubs, I think most of us do. My love for the drums started with Krupa when I was a little kid. I remember buying Sandy Nelson's "Let There Be Drums." Awesome! 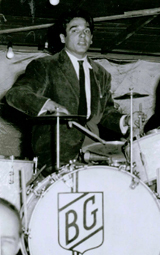 And what about the New Orleans funk guru, Earl Palmer? Then there was Ringo, Charlie Watts, Jim Keltner, Levon, Big Bonzo Bonham, Carlton "Rocksteady" Barrett and the impeccable Al Jackson. All totally different. All totally wonderful! Cool as a Belfast Cowboy! So I'm fourteen years old and strolling around the village with an acoustic guitar over my shoulder. I go to my pal's house for a cup of tea and he asks me if I'd ever heard of Van Morrison. "Oh yeah," I say, "The singer with that Belfast outfit, Them, G.L.O.R.I.A. and all that." "Yeah, that's right" he says, "But listen to this, it's, eh, different." We sat together and listened to the whole of side one of Astral Weeks without saying a word. Wow! It was the coolest thing I'd ever heard and I've had total respect for the man ever since. Looking back now I still wonder how such a young guy could have such an incredibly worldly and sophisticated approach to making music. The master had painted his masterpiece and he was still only 23 years old. He continues to make great music. Who on earth could resist that Celtic swing thing? If you've got something to say . . .
Couldn't go without a nod in big John's direction. Working class or not, he was my hero, the King of Rock 'n' Roll. Top Twenty Albums . . .
Not sure if I could ever really settle on a top twenty, but the following records would keep me happy for a long, long time! I didn't realise until I wrote down this list just how much good music had been crammed into such a short space of time.